Daily Debate: What Is Your Favorite Zelda Quote In A Non-Zelda Game? The Legend of Zelda is full of iconic quotes. If someone were to say “It’s dangerous to go alone! Take this.” they’d know it’s that famous first line that started it all. It’s always fun to spot these sayings referenced in other Zelda games that aren’t its originator, but what about other video games that generally have nothing to do with the Zelda series? One of my favorite uses of a famous Zelda quote was one I spotted in Skyrim. 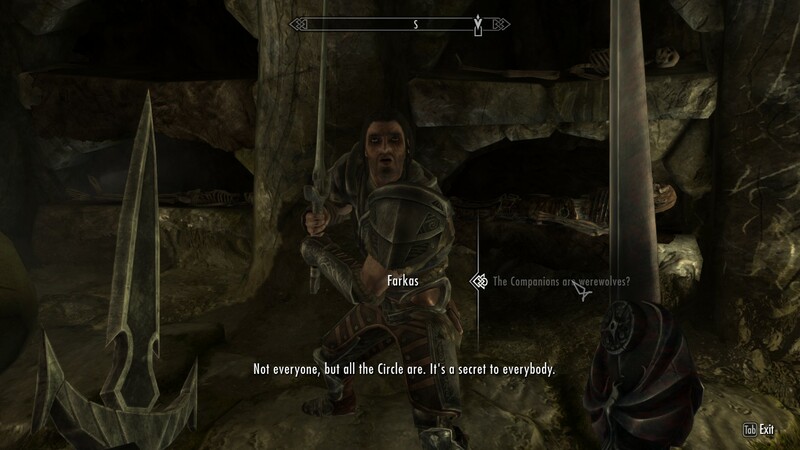 If you’ve played enough Skyrim, you’ve definitely come across the Companions questline, and there’s a moment when you find out through the Companion Farkas that some of the Companions of Jorrvaskr are werewolves. If you spend time talking to Farkas about this instead of shrugging it off and continuing on with the quest, he states that it’s only the Circle who are werewolves and that “It’s a secret to everybody”, which is a famous Zelda quote that’s popped up in the majority of the franchise, but was first said in The Legend of Zelda. I always really enjoy hearing Zelda quotes in other games, as it’s almost like getting a shoutout for my favorite game series. What do you guys think? Have you seen other games use Zelda quotes like this? If so, which is your favorite? Feel free to share your thoughts and experiences in the comments below!